Brand-New Private Label Ecourse Lets You Easily Teach Your Customers and Subscribers The Basics of Using Article Marketing To Promote Their Own Business, Products and Services! With this course youll be able to provide your subscribers with great information that they can actually use! * How they can use article marketing to attract more targeted prospects, increase exposure for their business and make more sales as a result. * How using articles can help them obtain a better search engine position for their webpages and how it will benefit their business. * Some extremely great ways that article marketing can benefit their business in a big way. That they may not have considered before. * Theyll also discover some costly mistakes that many article marketers unknowingly make, so that they can avoid them. * Plus some of the key elements included in an effective article marketing campaign, so that they can plan a successful strategy for their own business. And thats just the beginning. 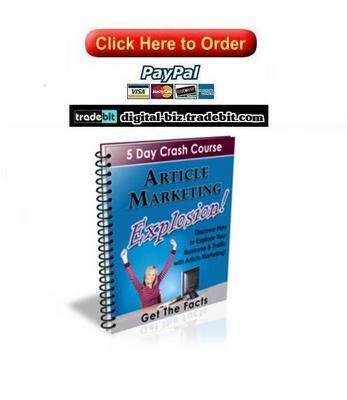 Once they sign up for the Article Marketing Explosion Crash Course they will have access to great information in every lesson that will give them a better understanding of how to start their own successful article marketing campaign and they will thank for it!